We all know that social media has gained a reputation for retouched photos portraying the make-believe adventures of lifestyle influencers. But for designers, it’s now easier than ever to start from a blank canvas and build idealistic, realistic photos from scratch. Sam_Does_Design was built on the notion of de-mystifying the design world with transparent posts, but that hasn’t stopped the use of visuals to portray an altered reality. What are the implications and ramifications of rendering images and sharing them as real life? How can artists and designers use these skills to beat the Instafamous at their own game, and can we do it ethically without lying? Gwilt is an industrial designer with an eclectic mix of skills. He graduated Brunel University London and worked for Paul Cocksedge Studio, specialising in bespoke lighting installations and exhibitions internationally. 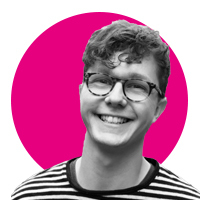 He now works with clients globally at consultancy Precipice Design, and also runs an Instagram and YouTube channel – Sam_Does_Design – where he shares industry tips with the community.